DIY Liquid Laundry Detergent Recipe (No Soap) - Oh, The Things We'll Make! 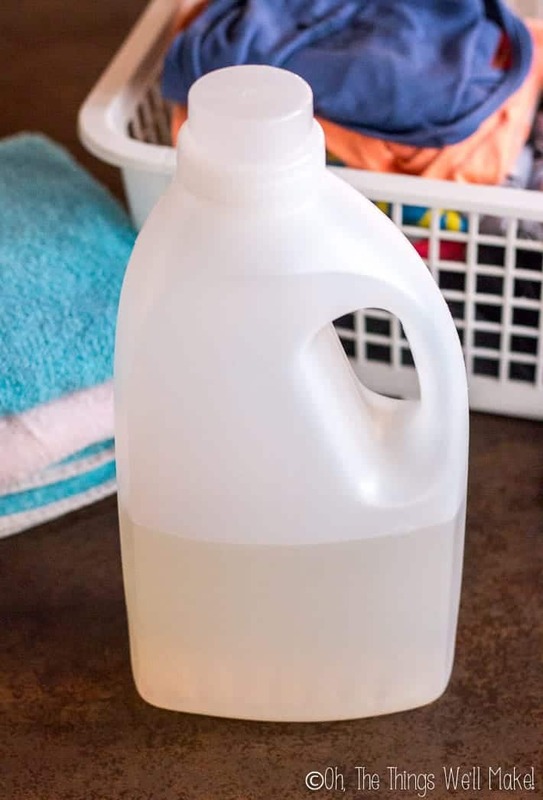 Save money while you avoid the synthetic fragrances and other additives in commercial laundry detergents by learning how to make a DIY laundry detergent at home. Over a year ago, I showed you how to make a homemade laundry “detergent” using soap. It was actually a guest post written by someone who works in a cleaning company. It is very simple to make and uses very natural ingredients like soap flakes and baking soda. Heck, I even showed you how to make a laundry soap with coconut oil, a super easy soap that is perfect for that sort of recipe (and for beginner soap makers!). I made and used her “detergent” recipe quite successfully for many months before I started dabbling in the world of working with surfactants. While my original recipe worked well for me for quite some time, it's not the most ideal solution for cleaning your clothes, especially for those who have hard water. Soap is susceptible to forming what is known as soap scum. It's a bit of a buildup that forms when the soap is added to hard water. Hard water has calcium and magnesium ions that react with the sodium salts in the soap. The reaction results in calcium and magnesium salts which are precipitated as soap scum. Why is soap scum a problem? Soap scum is a problem because it can build up on your clothes and can bind with it other undesirable substances like oils and dirt, but also possibly bacteria and/or other microbes. Many people successfully use soap-based laundry detergents without noticing any problems. Others, though, notice that their clothes appear dingy after repeated use. Perhaps I was able to avoid the unpleasantness due to the fact that we have a water softener at home. We live in an area of Spain with very hard water, and most of the family was feeling itchy after showering. Plus, I constantly felt a buildup in my hair, even when I experimented with washing my hair with only water for a while. So, we finally installed a water softening system. With softer water, soap scum isn't as big of a problem because you won't have as many calcium and magnesium salts precipitating out. Detergents also can save you from soap scum buildup. After repeated washings with soap, many people have decided to do what's called “stripping,” basically a deep, thorough cleansing of the clothes with substances that help remove the mineral buildup in their clothes. You can read more about the problem with using soap-based laundry detergents, and about stripping your clothes here. I actually tried doing it with a DIY mix of borax, washing soda, and Calgon, and while I did end up with somewhat yucky looking water, it didn't look that much different than the water obtained from “stripping” my newer clothes that had only been washed in detergent based cleansers. That, again, could also be due to the fact that I have soft water so my clothes probably didn't have as much of a soap scum buildup on them. Why make your own Laundry detergent? Once you get over the initial fear of working with new products, though, you'll realize that it's still a really great idea to make your own laundry detergent. Making your own laundry detergent saves money! Let's start with one of the biggest advantages of making your own detergent: it's a great way to save money! Most “natural” laundry detergents are expensive. Heck, even the not-so-natural ones tend to be overpriced when you think about their composition. They are mostly water mixed with some surfactants and many of those surfactants are actually quite inexpensive! This, of course, depends on where you are buying them and in what quantities. I bought 5 liters of SLS here in Spain for just over 20 Euros. That's enough for me to make many bottles of detergent! When you make your own laundry detergent, you have more control over the ingredients. One of the main reasons I like to make my own detergent is that I try to avoid synthetic fragrances in most store-bought detergents, some of which are very strongly scented. I'm actually quite sensitive to many of those fragrances and find myself nauseous when I'm in the same room with somebody who uses strongly scented detergents and fabric softeners. Making your own detergent also allows you to avoid any ingredients that are problematic for you! Isn't sodium lauryl sulfate bad/unnatural/to be avoided? So, I'm talking about controlling the ingredients and using more natural ingredients, and then I go and use one of the most hated surfactants of all time, right?!?!? Sodium lauryl sulfate, aka. SLS, is a detergent type surfactant that does a wonderful job of cutting grease. It makes lots of suds and it is very inexpensive. It's also derived from coconut oil and is completely biodegradable, something that most green-minded people should appreciate. But isn't SLS bad and cancer causing? While it does find its origins in coconut oil, it also needs quite a bit of synthesizing to make it, so it's not really a very “natural” product. That is enough to make some people want to avoid it, but sometimes “natural” isn't always best. 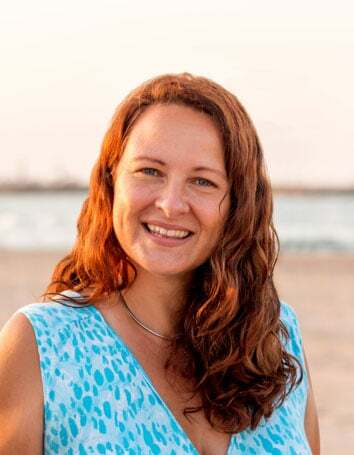 (I would choose a lab-made iron oxide colorant over a completely natural one for homemade cosmetics as the naturally foudn ones are usually contaminated with heavy metals.) What we are looking for is making products that are safe. While I prefer natural products, safety trumps natural for me any day! SLS does have other disadvantages. It is a rather harsh surfactant, when compared to some of the others, that can irritate sensitive skin. It finds its way into a lot of personal care products where I don't really think it should be used (like toothpaste, for example, which is why you may consider making your own toothpaste instead). I personally don't and wouldn't use SLS in my homemade body care products like homemade shampoos. That said, laundry detergent isn't a personal care type product. The superior cleansing ability of SLS really works to our advantage when we are trying to clean our clothes of dirt and grime. For me, it's worth using here. I've combined it with gentler, more natural surfactants to help balance things out. SLS isn't essential in a detergent, of course, but it will make for a better cleaning detergent. I think even most “natural” detergents I've seen probably are using it without completely disclosing as they are afraid of the stigma associated with using it. (I often see the detergents with ingredients listed as “non-ionic surfactants,” the most famous of which, of course, is SLS.) You can read more about the categories of surfactants in my post about natural surfactants. Dr. Bronner's Sal Suds is another product that unapologetically uses SLS in it. In fact, their formula was my inspiration for this laundry detergent. (I also use this mixture for all sorts of general cleaning around the house!) They also touched on why they feel it's safe to use for general cleaning in the post on their website. As I mentioned earlier, you could experiment a bit with varying the different surfactants in this detergent recipe. This recipe, however, is thickened with salt, and not all surfactant combinations will thicken in the same way (or at all) when using salt. 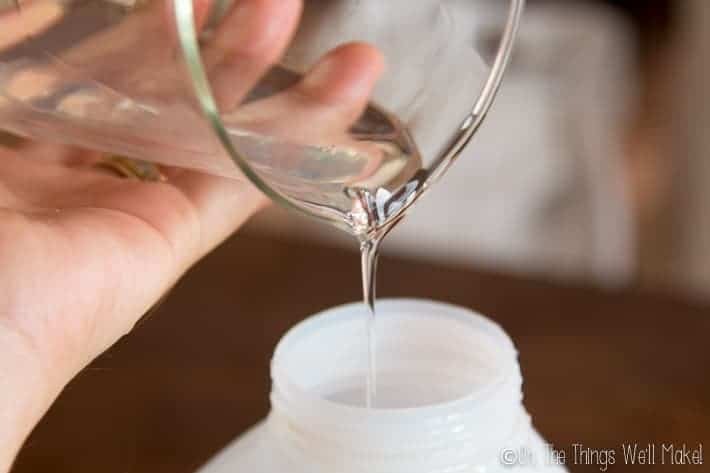 Certain surfactant mixes can easily be thickened by adding salt to them and it's a wonderful way to thicken them because you don't need to deal with gums or other thickeners. This recipe is one example where salt works perfectly for thickening up the detergent. Without it, the detergent will still be concentrated and potent, but it won't really look that way. You'd end up with a very liquidy product. Most people equate thick, viscous soaps and detergents as being more concentrated, even when that isn't always the case. The salt in this recipe is around 2% of the recipe and I've found that it makes for a nice thickness. You may be able to thicken it even more with slightly more salt, but you have to be careful when experimenting with the amount of added salt. The thickening properties of the salt follow what is called a “salt curve.” The product will continue to thicken up until a certain point. After that, adding more salt will only thin out the product again! You can use different salts to thicken your detergent. Because I usually use pink Himalayan salt in my kitchen, I used that in my first batch of detergent, and it ended up being pink. If you are determined to make an SLS-free detergent, you'll have to do some experimentation. You'll likely want to use a higher total concentration of surfactants, too, as the more gentle, natural surfactants aren't as effective at cleaning. My recipe uses around 23% surfactants, but when using gentler surfactants, you'll want to find combinations of surfactants that complement each other, and will likely want to use somewhere around 30-40% or even more. Do you need a preservative? Any homemade product with water in it will need some sort of preservative to keep bacteria and mold away. The surfactants on their own are either self-preserved (by extreme pH's) or have preservatives added to them to keep them free from microbial growth. Once you start adding more water to them, though, you'll need to find a way to keep the microbes away. Their recipe differs from mine in the use of sodium sulfate (normally used as a filler in powdered laundry detergents) and potassium hydroxide. I'm not quite sure why they chose to use sodium sulfate in a liquid detergent type product. Potassium hydroxide is a strong base that I use when making liquid soap. I could be wrong here, but my suspicion is that they chose to add it to alkalinize the mixture which makes it inhospitable to microbes. If you can make a product with a pH higher than 9 or lower than 4, you don't generally need a preservative. (Sal Suds have a pH of around 9-9.5 according to a friend of mine who tested with pH test strips.) This, of course, depends on what sorts of ingredients you are using. Organic type ingredients like milks, plant material, and clays are more difficult to preserve. Normally, though, it should keep your product safe for up to a year. This is also the main reason that you don't need a preservative with liquid soaps. Most preservatives don't work very well at high extremes anyway. Without adding KOH to this recipe, my detergent falls has a pH of around 5. I haven't tried adding KOH to this mixture yet, but probably will the next time I have to mix some up. 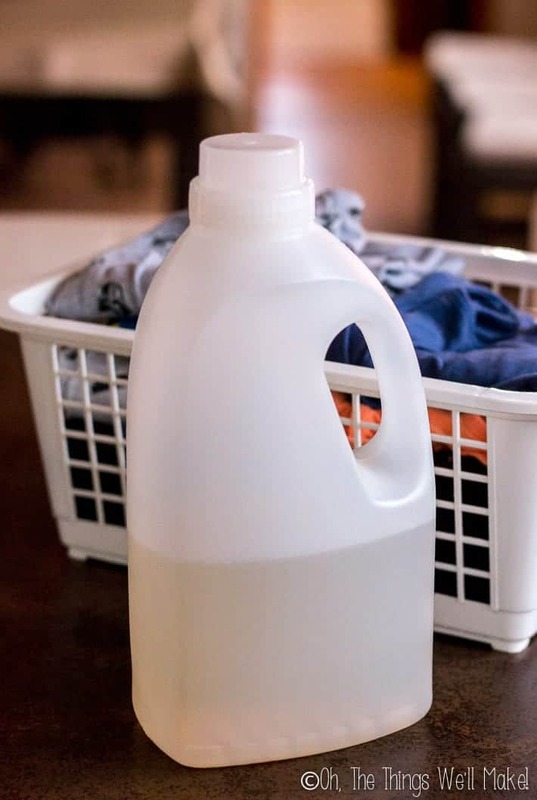 It is likely the most cost effective solution to preserving a detergent like this one, especially if you already like to make your own liquid soaps, so it's really a great way to preserve the product. I'll let you know my findings when I get around to it. There are a number of natural preservatives that you can use to preserve this product instead. I've been using one called Sharomix 705. It's an Ecocert safe preservative that seems to be doing a pretty good job in my formula. (Sharomix can be used in products with a pH under 5.5, and should be used at a concentration of 0.6-1.2% of the recipe.) I had bought it inexpensively in large quantities, so I had plenty at home to use up and experiment with. The important thing to keep in mind here is that you'll want to make sure the pH of the detergent is adequate for the preservative you are using. Most suppliers will share the effective pH range for their particular preservative. They'll also let you know an effective percentage to use. In my recipe below, I've used the preservative at 1% of the recipe. That's a general range that is the amount needed for many of the more popular natural preservatives. Some of them may need to be used in higher quantities, in which case you could reduce the water content to make up for the addition of more preservative. I've been doing more research on a number of natural preservatives and hope to get a post about them to you soon! Begin by adding the surfactants to your container. 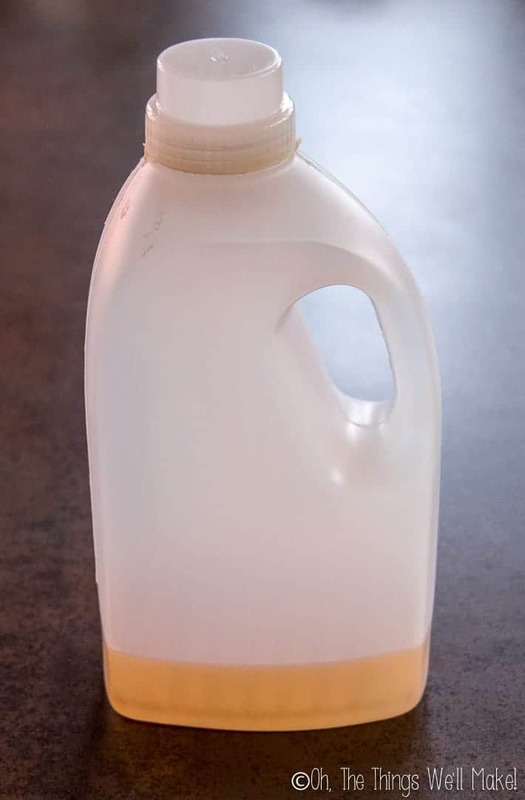 I cleaned out an old laundry detergent bottle from a natural laundry detergent that I had bought in the local eco-supermarket. The easiest way to add them is to tare the scale with your container on top to set the scale to zero. You can then add one of the surfactants before taring the scale again. Taring the scale between adding each ingredient is the easiest way to weigh out your ingredients. Once you've added the surfactants, add the distilled water. You can now gently stir or agitate the bottle to mix the surfactants with the water. Mix them gently so as not to form too much foam. To help boost cleasning, you could consider adding some baking soda to your wash water too and/or use vinegar in your final rinse as a natural fabric softener. Now that you've made your own laundry detergent, why not make your own natural fabric softener and wool dryer balls too? This recipe is giving me hope! I have extremely hard water (well water!) and haven’t been able to find a safe laundry wash, DIY or not, that actually produces clean clothes. So many loads of laundry have come out stinking on the other side in the name of health. Right now I’m using a cheap store brand because it does at least work! So I have no problem with SLS in a recipe like this and I’m excited to try it. Thank you for sharing! I have one question – I have a bunch of laundry powder from a natural company that doesn’t work well, and I’ve heard that adding baking soda can help it work better in hard water. Do you think that’s true? How much would I use? You seem to understand all this stuff so well. 😄 I’m more interested in making my own, but I’d like to salvage what I bought if I can. Thank you! As for your powder… Do you know what’s in it? Can’t wait until my diy laundry soap runs out. In the meantime, getting my supplies together. Not able to find Sharomix 705 in the US. Do you know where it can be ordered? Or, have you found any other preservatives that work well? I had someone check on the pH of Sal Suds for me as it’s not something I can easily buy in Spain, but I have to look to find her answer. I’m starting to think that it may be the best option for preservation- and I want to make a new post for a Sal Suds copycat- and update this post with my findings there. So, you may not need a preservative- and may prefer to increase the pH with KOH instead. I have made some coconut soap using your recipie and it is lovely. I would like to progress to making other things, such as this laundry detergent. All the links for Amazon are to the US site. Could you tell me where you source your products in Spain. I live in France but often go through Spain en route to Portugal. A Spanish link would be fine as Amazon Spain delivers to Portugal and sometime soon to France. The coco betaine and most of my other stuff, I buy through another place because they tend to have more things that are all natural. Gran Velada may have many or all of them, though, if you prefer to buy your products all together from the same place. The other place I buy from sells on Amazon but also have their own store off Amazon. You can find the link to the coco betaine here: https://amzn.to/2DQuSNw (An affiliate link- I get a commission on sales through that link) and see their other products on Amazon by clicking on their store name. Or- you can also find things directly at their store cremascaseras.es . Will this work in HE washers? Thx! I’m really not that familiar with the HE washers, although I’m pretty sure my mom got one at her new house back in the US. Here in Spain, they aren’t really a thing. All of the washers are front loading and all pretty similar. It says to use less or use a less foaming type detergent. So, my best guess is that you could either dilute the detergent more or use less and you should be fine. You could also reduce the amount of SLS. That’s the surfactant that gives the most foam and the highest cleaning power in the recipe. The other surfactants are very, very mild. Thanks so much for this great recipe. I would like to ask if you would allow me to translate it to Bahasa Indonesia and repost it in my blog. I will provide the link to your actual post. Our beloved Jakarta Governor Mr. Baswedan posted on FB his concern about the contamination in our seas and rivers caused by detergent. I commented on the idea for mums to make their own laundry detergents and receive many feedbacks. Unfortunately language is a bit of barrier so I thought I can help translating your recipe for them and post it on my blog for easy reference. Awating for your reply Tracy. As for the powdered surfactants. I haven’t used them, so I’m not sure how much you would need to add. I can see if I can find information for the dilution rate of the liquid SLS I bought to give you a guideline if you’d like to experiment with it. Thanks Tracy for the reply and for the permission. I only have a chance to get all the materials today. I found them all here Alhamdulillah. By the time I am writing this the liquid is getting dissolved and getting thicker. I am so happy. I will post them on my blog and link back to you. I have posted the recipe on my blog in Bahasa Indonesia with the link to your original recipe. I look further on SLS and I found an article about the difference between SLS and SLES here. It says SLES is much milder to skin than SLS though. Your opinion is very much appreciated. I think when I first started researching, I saw the same as you. SLS is supposed to be harsher on the skin. On the other hand, SLES is normally classified as having a higher potential for concern in safety databases such as the EWG Skin Deep database. I can’t remember the reasoning. I think it is often contaminated with chemicals that can be hurtful to us and the environment. In the grand scheme of things, it’s not a huge difference, and I think there is a debate on it. I wouldn’t worry too much about it either way. I prefer not to use either for skin care products anyway, so it’s really not a huge deal. I do prefer to use something as biodegradable and unharmful to the environment as possible. I’ve been working on DIY laundry recipes for a while now, thank you for the clear explanations and the ‘why’ behind your choices. Looking forward to more articles like this in 2019!